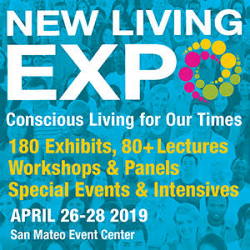 The New Living Expo is a unique event that brings together thought leaders, teachers and respected authors in programs designed to enhance awareness, creativity and mindfulness in an ever-expanding and complex world. David Wilcock is a double New York Times best-selling author, a regular in over 100 episodes of Ancient Aliens on History Channel, and the main star of the #1 hit documentary film, Above Majestic, in which David’s far-reaching investigations explore the boundary where science and spirituality become one. His three published books contain over two thousand academic references and cover sacred science, extraterrestrial life, Ascension, the Deep State, secrecy, cover-ups, insider testimony and classified information at 35 levels of need-to-know, above the President of the United States. As of February 15th, 2019, there were 5.98 million videos on YouTube with David Wilcock’s name in the title, which shows the far-reaching impact David has had upon the collective of today. This will be the only talk that David will be doing at the expo this year. Kimberly Meredith is a medical intuitive, trance channeler and psychic surgeon. Kimberly channels messages through her eyes’ blinking codes as a tool of communication from God, Mother Mary and Angels. After her near-death experience, or NDE, she underwent numerous tests, including with PsyTek Subtle Energy Laboratory and Research Facility and with Dr. Norm C. Shealy, and the results confirmed her ability to emit scalar energy – even through walls! Kimberly’s healing abilities reveal the convergence of God and science. James Van Praagh is a pioneer in the field of mediumship and one of the most celebrated and respected spiritual teachers working today. He has brought a mindful awareness of “communication with the dead” into the public psyche for the past thirty years. James provides evidential proof of life after death via detailed messages from the spiritual realms. He has brought spiritual insights to millions with his numerous guest appearances on Oprah, Dr. Phil, Larry King Live, 20/20, The View, The Today Show, Chelsea Lately, Beyond Belief, Biography, Coast to Coast, 48 Hours, and a multitude of others. Graham Hancock is the author of the New York Times bestseller Magicians of the Gods, and of the major international bestsellers The Sign and The Seal, Fingerprints of the Gods, and Heaven’s Mirror. His books have sold more than nine million copies worldwide and have been translated into 27 languages. His strong presence on the internet, and his public lectures, radio and TV appearances, including two major TV series for Channel 4 in the UK and The Learning Channel in the US – Quest For The Lost Civilization and Flooded Kingdoms of the Ice Age – have put his ideas before audiences of tens of millions. He has become recognized as an unconventional thinker who raises controversial questions about humanity’s past. Hancock’s new book America Before: The Key to Earth’s Lost Civilization, will be available from 23 April 2019. Caroline Myss is an internationally renowned pioneer in the field of medical intuition and a New York Times best-selling author of many books, including Anatomy of the Spirit; Why People Don’t Heal and How They Can; Sacred Contracts; Invisible Acts of Power; and her most recent, Entering the Castle. She has produced more than 30 recorded titles for Sounds True and has taught in 35 countries. In 2003, Caroline established the Caroline Myss Educational Institute, dedicated to creating educational programs in the fields of human consciousness, spirituality, mysticism, health, energy medicine, and medical intuition. David Lonebear Sanipass is a Mi’kmaq elder and storyteller who comes from a family of basket-makers from Northern Maine. David was trained extensively by Elders who traveled from around the world to the mountain where he and his family lived. Not only was he taught traditions and ceremony, but was extensively trained in science, physics, history and math.